Ed McCarthy then spoke about Vintage Blanc de Blancs. They are made from the best grapes from the choicest vineyards. The aromas and flavors are more concentrated and are more full bodied. Ed McCarthy and friend at the WMG Champagne Tasting and Lunch. They are aged longer which adds more complexity and the grapes are from one vintage which is always an above average year or an excellent one. He said that for him vintage Champagne was the better buy conceding the quality but added not every occasion calls for vintage Champagne. 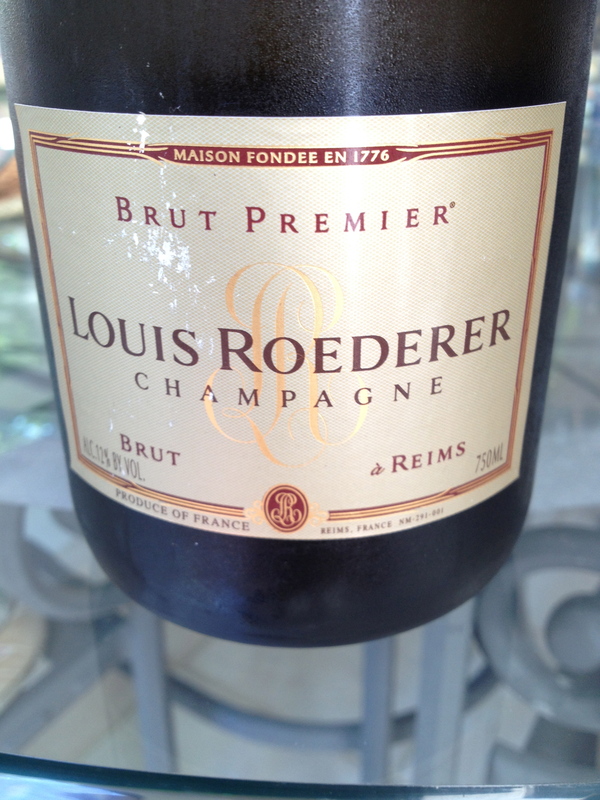 He likes vintage Champagne with dinner and non vintage Champagne as an apéritifs. Domaine Dehours, Brisefer, lieu-dit, 2005, 1.3 ha site specific plot in Mareuil le Port in the Marne normally planted to Meunier. This site was planted to chardonnay. Aged on the lees for 7 years. 3 grams dosage. Neutral barrel fermented. This is a wine with citrus flavors and aromas, with hints a grapefruit and apple and a touch of vanilla. $95. Champagne Pol Roger 2008 made from grapes from the Grand Crus of the Cõte des Blancs: Oiry, Chouillu, Cramant, Avize and Oger. There are two débourbages (settlings) one at the press house immediately after pressing , the second “a froid” in stainless steel tanks at 6C for 24 hours. A slow fermentation takes place in stainless steel tanks with each variety and each village kept separate. There is full malolactic fermentation prior to the final blending. The secondary fermentation takes place in bottle at 9C in cellars 33 meters below street level. It remains here until it undergoes remuage (riddling) by hand a rarity in Champagne today. The wine has hints of grapefruit, apricot and a touch of apple. Produced in limited quantities, this cuvee has been aged for 7 years in the cellars before release. $115. This Champagne was showing very well. 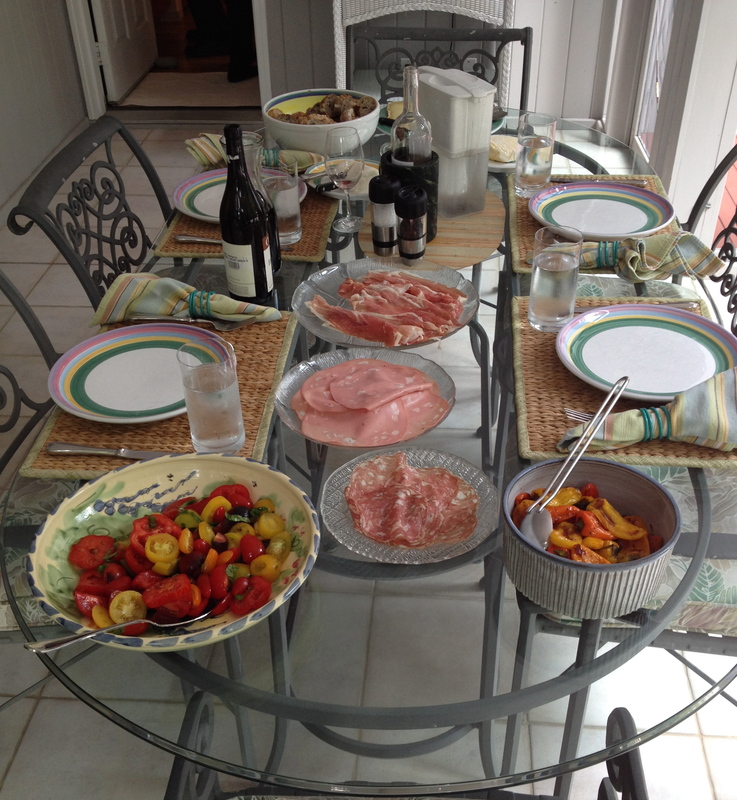 We spent my birthday weekend in the Hamptons at the home of our friends, Ernie and Louise De Salvo. Louise is an excellent cook and Ernie and I have the same taste in wine. 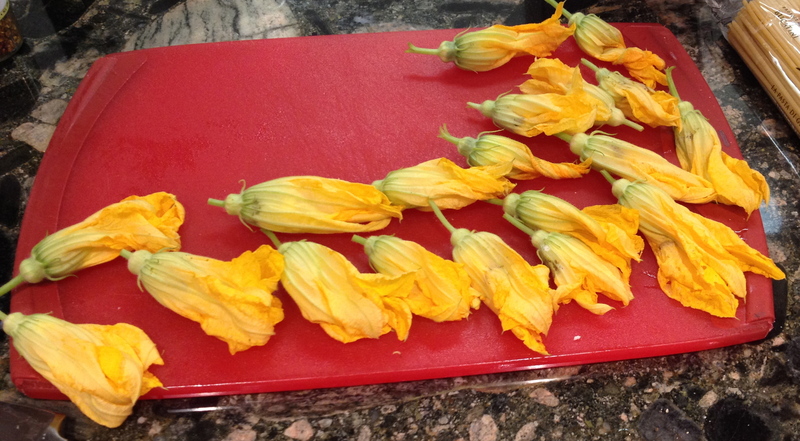 We started with lunch on Saturday with zucchini flowers stuffed with mozzarella and anchovies in a batter and deep-fried. This is one of my favorite foods and I have it whenever I am in Rome. With this we had a wine from a producer I did not know but it was a perfect combination with the flowers because it is a wine with a depth of flavor,hints of citrus fruit and good acidity. 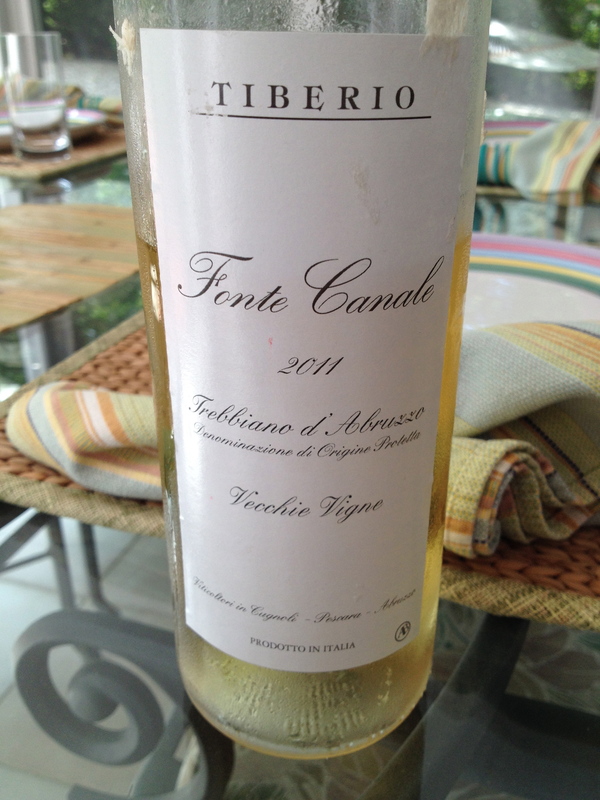 Trebbiano d’Abruzzo “Fonte Canale” 2011 100% Trebbiano d’Abruzzo from old vines from Tiberio. The vineyard is at 300 meters, there are 2,500 vines /hectare and the training system is the tendone (vines form a canopy to protect the grapes from the sun). Harvest takes place the last week of September. Cold maceration on the skins lasts for 6 hours. Vinification takes place in stainless steel and malolactic fermentation does not occur. The wine remains in the bottle for a short period before release. 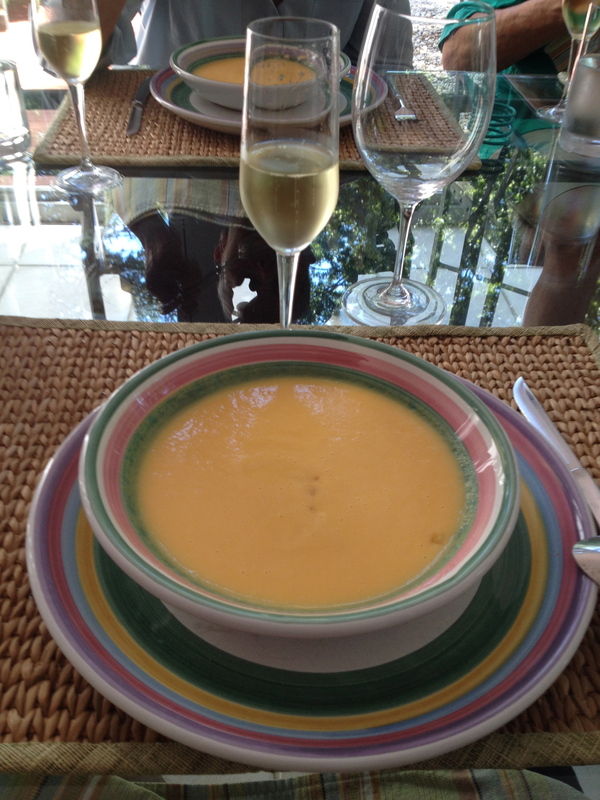 One of the dishes that Louise makes, which I love, is a cold melon soup with ginger. This was an interesting combination that worked well because the wine had nice fruity aromas and flavors and a hint of creaminess. Barbera d’Alba 2001 Giacomo Conterno made from 100% Barbera d’Alba. The vineyard is in Serralunga d’Alba, the soil is calcareous limestone and the exposure is west/southwest. Vinification lasts for 2/3 weeks in wooden vats with regular breaking of the cap. The wine is then aged in large oak barrels for two years. Note–With the 2012 vintage, the Barbera with have Francia on the label as opposed to Cascina Francia, but the wine will remain the same. When there are many different flavors in the foods Barbera is always a good choice because it is a red wine with good acidity. This one worked very well with the 3 cheeses, salumi, prosciutto, mortadella and best of all the flavorful roasted peppers made by Louise. 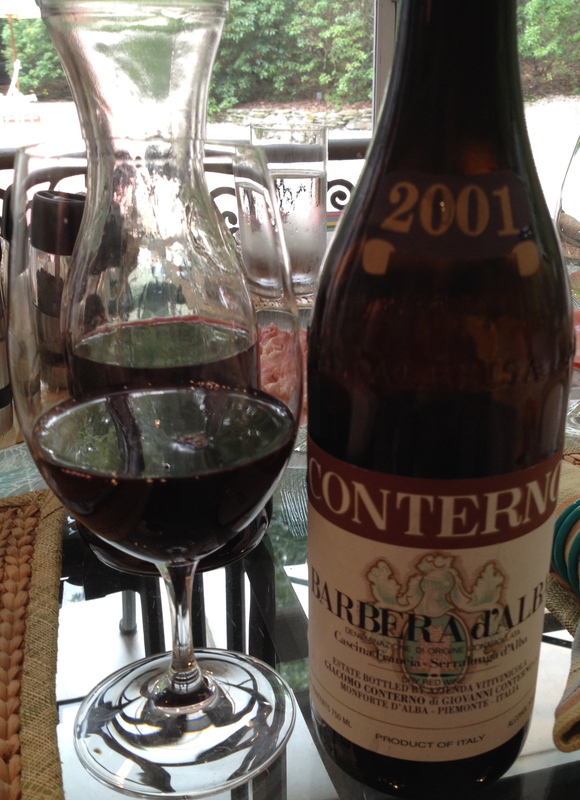 The better Barberas can age for 20 years and this one was showing no signs of age. 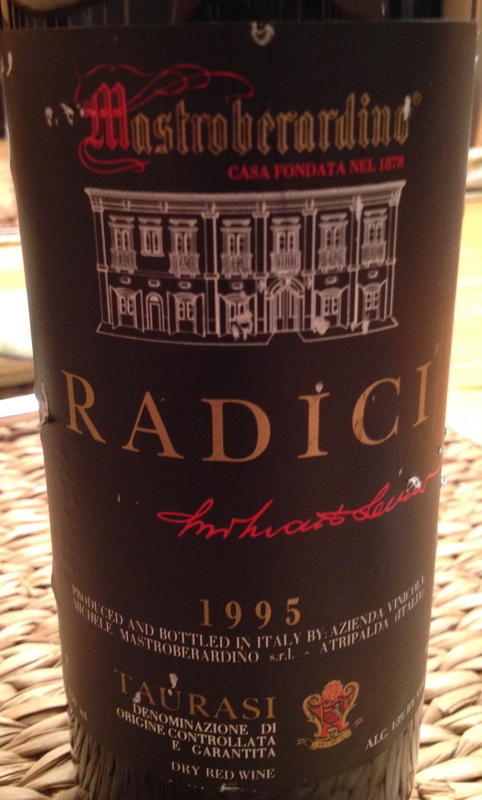 Taurasi Riserva 1995 100% Aglianico Mastroberadino The soil is poor in organic substances but with a high content of clay, limestone, minerals and microelements. The vineyards are on two hills, Mirabella vineyard at 500 meters and the Montemarano vineyard at 550 meters. Because of its position on the hill and its altitude, the temperature at the Montemarano vineyard is much colder and the grapes are picked a little later. Harvest is from the end of October into the beginning of November. The vinification is the classic one for red wine, long maceration with skin contact at controlled temperatures. The wine spends one year in Slovenian oak barrels and two years in bottle, the wine can be laid down for 10 to 15 years. The riserva stays in medium sized 40 to 50HL oak casks for 2 years and 2 years in bottle. It can live in the bottle for 25-40 years. This is the way I believe the 1995 was produced. The wine was showing no signs of age. This is a full, complex wine with hints of black cherry, plum, spice, smoke and a touch of leather. I was in the mood for Taurasi for my birthday. 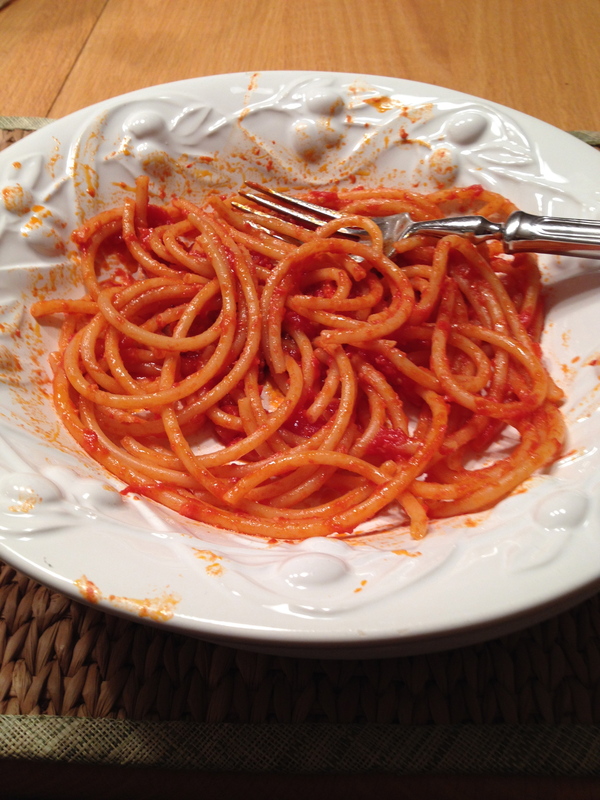 My favorite pasta is Pasta Matriciana and I had to have for my birthday along with the Taurasi. 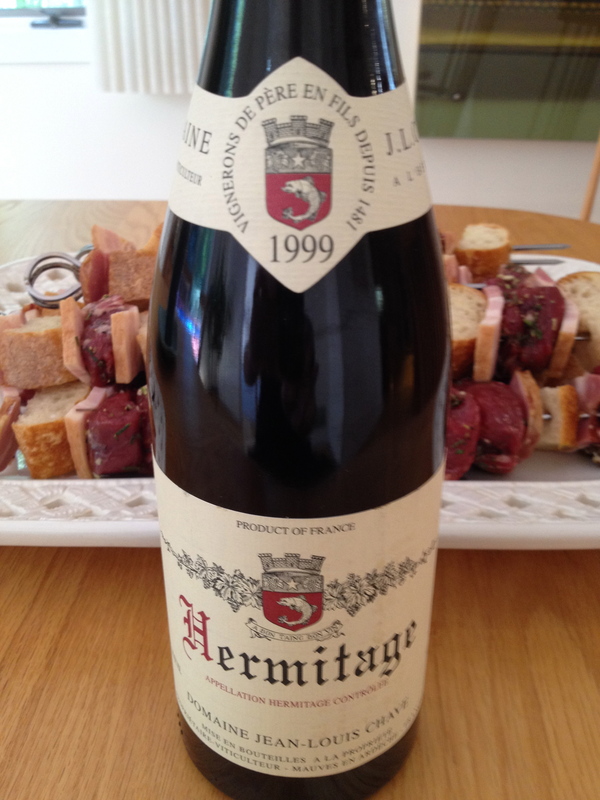 Hermitage 1999 Domaine Jean-Louis Chave. It is made from 100% Syrah from 50 year old vines from some of the best plots in Hermitage with different soils. The wine is aged in 228 oak barrels for 18 months, 10 to 20% new and the rest 1 to 5 years old. Ernie makes the best lamb on the grill. 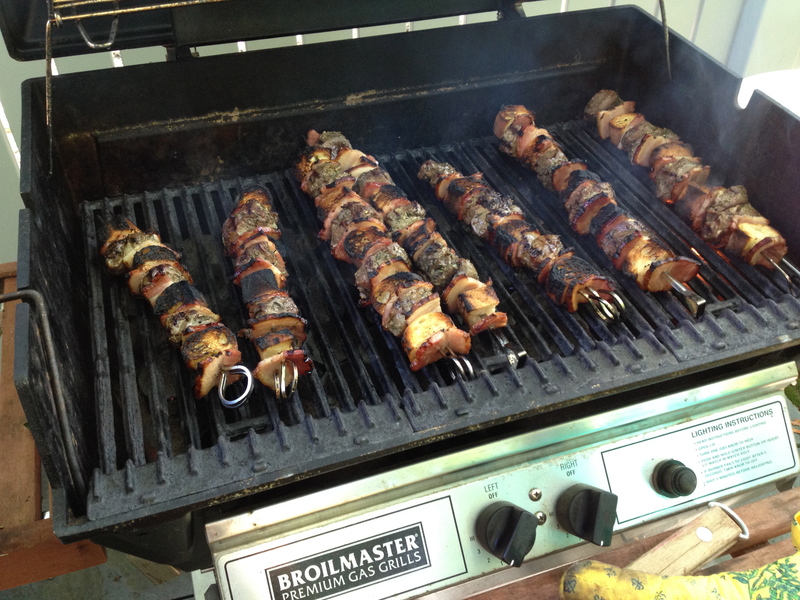 He takes pieces of lamb and thick slices of bacon and skewers them. A big wine like the Hermitage was perfect with its depth of flavor and hints of black and red fruit. 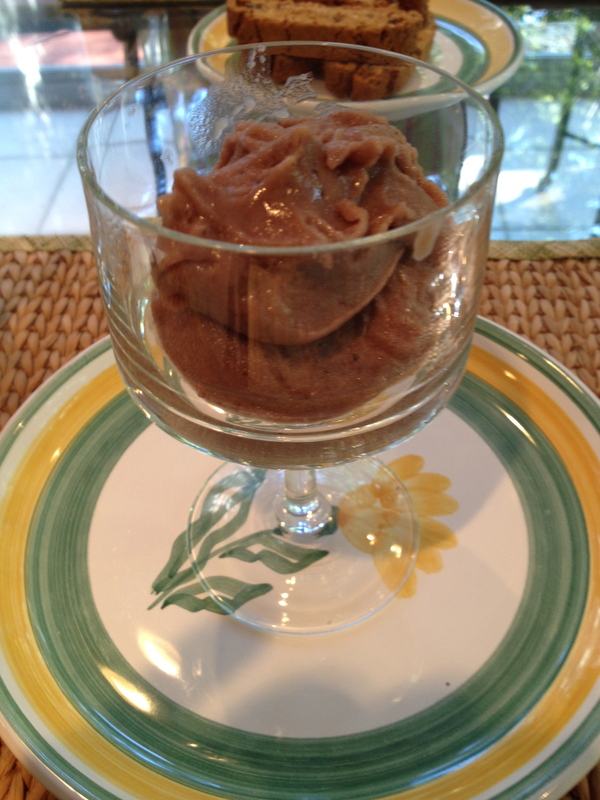 For dessert Louise made fig ice cream. I like it so much that the next morning for breakfast before we went home I had the fig ice cream Sicilian style — sandwiched on a warm brioche.